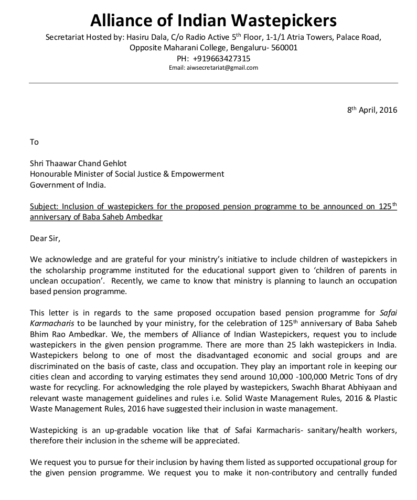 The Alliance of Indian Waste Pickers has submitted the following letter to Ministry of Social Justice & Empowerment, Government of India on 8th April, 2016 to demand that waste pickers be covered by a proposed pension scheme slated to be launched on April 14, 2016. The letter requests the Ministry to ensure the inclusion of waste pickers in the scheme. To: Shri Thaawar Chand Gehlo. Honourable Minister of Social Justice & Empowerment. Government of India. This letter is in regards to the same proposed occupation based pension programme for Safai Karmacharis to be launched by your ministry, for the celebration of 125th anniversary of Baba Saheb Bhim Rao Ambedkar. We, the members of Alliance of Indian Wastepickers, request you to include wastepickers in the given pension programme. There are more than 25 lakh wastepickers in India (2,500,000). Wastepickers belong to one of most the disadvantaged economic and social groups and are discriminated on the basis of caste, class and occupation. They play an important role in keeping our cities clean and according to varying estimates they send around 10,000 -100,000 Metric Tons of dry waste for recycling. For acknowledging the role played by wastepickers, Swachh Bharat Abhiyaan and relevant waste management guidelines and rules i.e. Solid Waste Management Rules, 2016 & Plastic Waste Management Rules, 2016 have suggested their inclusion in waste management. We request you to pursue for their inclusion by having them listed as supported occupational group for the given pension programme. We request you to make it non-contributory and centrally funded indexed pensions, so that waste pickers in their old age live with dignity. This will be another milestone in the struggle for social and economic justice of historically disadvantaged social groups.